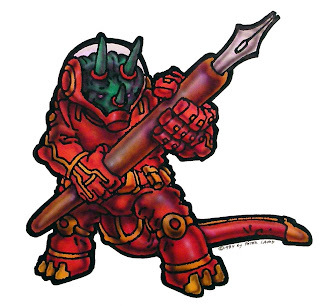 I'm not sure why I drew this Triceraton in 1984 holding a crow quill pen, but it was probably for fun. 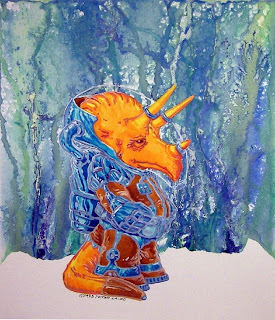 I was trying out my airbrush around this time, too -- I used it for some of the shading on this piece. 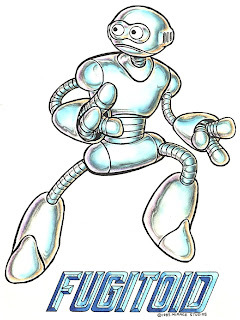 From 1992, this was one of the first of the series of amazing drawings Jim Lawson did for Team Mirage, the motorcycle racing team which I sponsored for several years in the mid-1990’s. 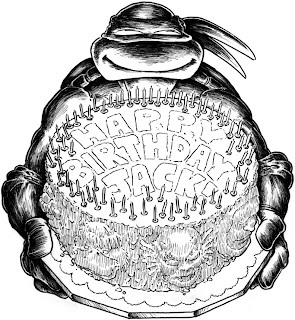 SPECIAL ANNOUNCEMENT FOR TMNT COMIC BOOK FANS! 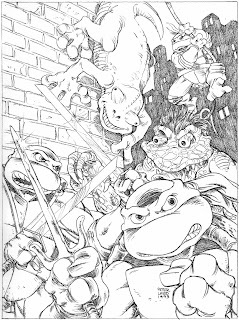 As of this past week, Jim Lawson has started penciling, from my plot, the first issue of the all-new Teenage Mutant Ninja Turtles comic book series which should see print sometime this year, hopefully late summer or early fall. 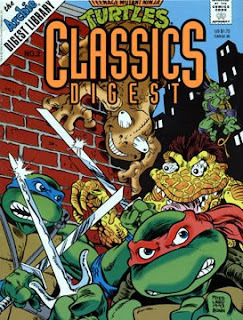 I'm not sure what kind of publishing schedule the new book will have -- possibly bimonthly like the original TMNT comic. It will be black and white, and the first issue (at least as it stands now, in rough layout form) will be thirty-two pages long. 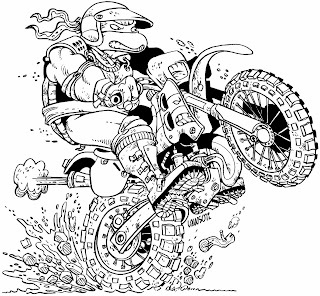 I'm very excited to be working on a turtle comic book again, and even more so to be working with my good friend, motorcycling buddy, and PLANET RACERS collaborator Jim Lawson. Now I have to go start inking...! ... which I referred to when I penciled the cover (below). 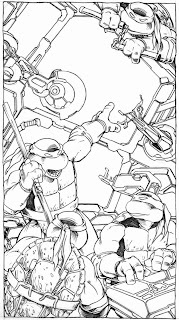 Ryan Brown inked these pencils (I think he may have inked all of the covers I did for the Archie TMNT comics). 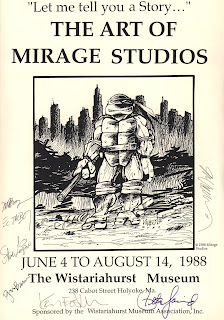 In the summer of 1988, we had the great pleasure of having the work of the Mirage Studios artists of that time -- Michael Dooney, Eric Talbot, Jim Lawson, Steve Lavigne, Ryan Brown, Kevin Eastman, and me -- showcased in a wonderful exhibit at the Wistariahurst Museum in Holyoke, MA (just down the road from Northampton). It was a lot of fun, and this is the poster from the event (with an image by Jim Lawson and Ryan Brown) -- signed by all of the exhibiting artists. 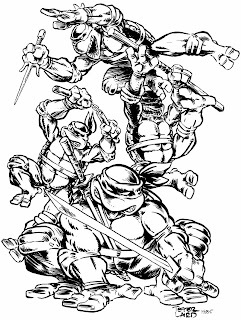 I don't think this was ever used for anything, but I like the rendering I did of the smaller “floating” turtles. Can’t say I’m digging the color choices I made for the Shredder and Casey Jones... what the heck was I thinking?! 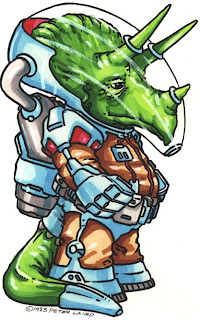 At least the Triceraton is the right color. 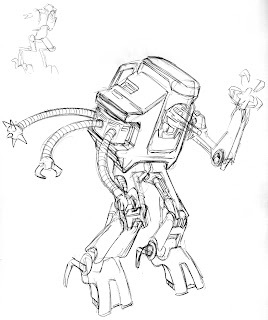 "Blast from the Past" #96: Sketches for Foot robot from "City at War"
The robot which the tech faction of the Foot created to fight the other Foot factions in "City at War" went through a couple of design changes. 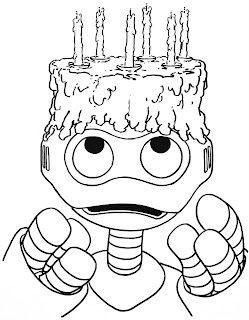 This is my first sketch for the robot. I stare at this pencil drawing by A.C. Farley in awe. 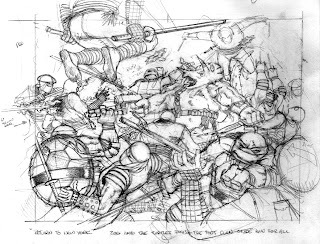 This is a sketch he did for the cover he was to paint for the “Return To New York” collected book published by Mirage Studios. The painting turned out to be extremely beautiful (typical Farley work), but this pencil drawing is amazing to look at for the composition and detail. 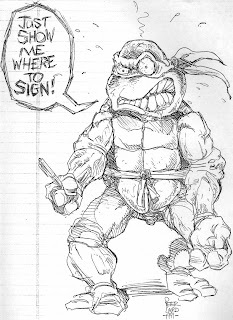 Blast from the Past repost #12: "Frustrated Turtle"
Laird colors on "Early Triceraton"
These two design sketches were done by me before Kevin and I started working on issue #2 of the original Teenage Mutant Ninja Turtles comics, so that would have been sometime in summer or fall of 1984. 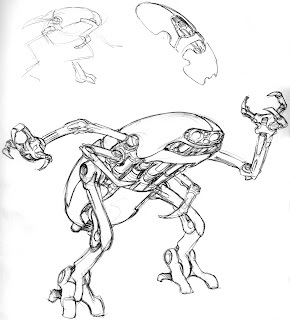 Apparently, at the time these sketches were done, two important things had not yet been decided upon -- Baxter Stockman's race, and April O'Neil's name. 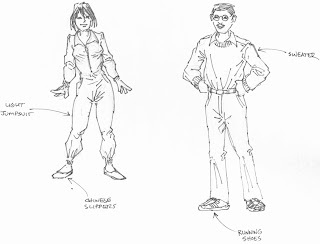 As you can see in this piece, I was going for a real "nerd" look for Stockman, whichever color he ended up being. April is just labeled "assistant" at this point. And from the drawing in the lower left of this piece, I guess I was still trying to work out how the Mousers would move when attacking. 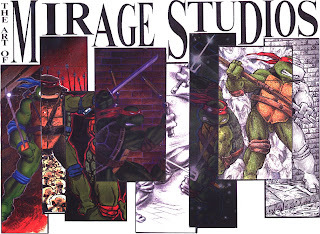 Blast from the Past #11 repost: "The Art of Mirage Studios"
...which I then split up into eight overlapping segments. 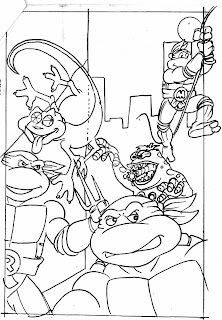 The segments were distributed among the artists to be finished in their individual styles, and the only rule was that they had to keep the basic positioning and shape of the turtle(s) in each section. I don't think this drawing was ever used for anything. 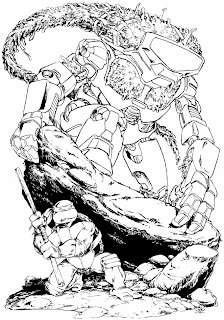 It's one that I drew just for the heck of it back in 1985. 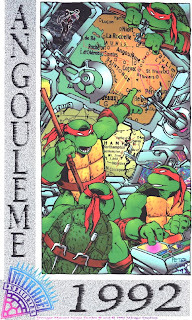 I have noticed some comments online regarding the upcoming "Back to the Sewer" season of the 4Kids TMNT animated show that have posited that when the Turtles return from the future world of the "Fast Forward" season, they have not actually returned to the world/time they left, but have somehow ended up in an alternate reality or parallel dimension. 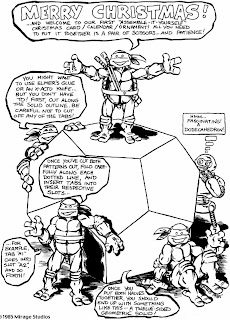 This is a drawing from 1984, probably done around the time the first issue came out. Kevin and I used to goof around doing wacky stuff like this, just for fun. 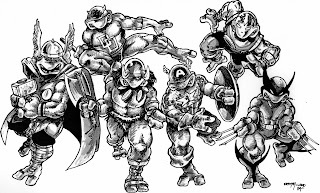 At the time, we were big fans of the Marvel Comics characters whose costumes these six (?!) 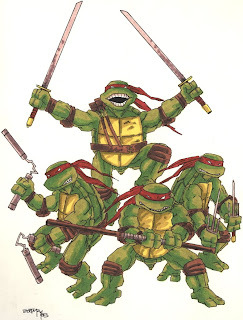 Turtles have appropriated. I believe Kevin penciled this and I inked it, but I can't remember if just one of us toned it -- it's possible that we both toned it, like we used to do with the comics. At one time I liked to do somewhat elaborate personal Christmas cards, especially ones which included some kind of design which required construction. 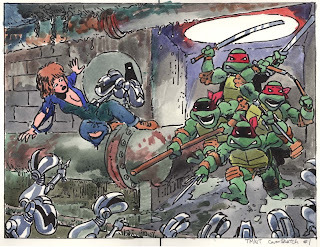 This is one of those, done in 1985. 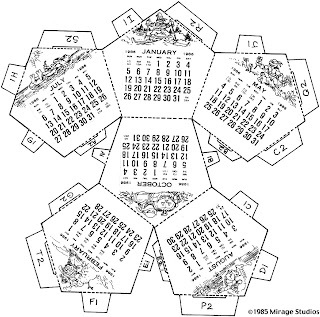 When carefully cut out, folded, and assembled, it forms a dodecahedron (twelve-sided solid) which can be hung as an ornament on a Christmas tree AND used as a desk calendar (only for the year 1986, unfortunately... although I suppose that eventually we will have a year with matching dates... I just don't know when that will be). What fun! 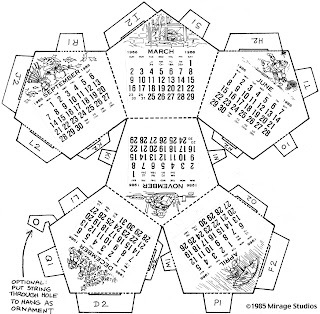 I designed this one and drew all of the little seasonal Turtle illustrations. 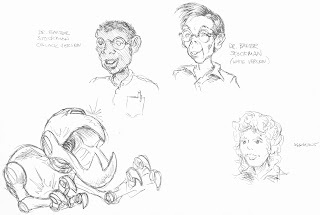 "Four Reptiles and a Rodent" portfolio -- now available! 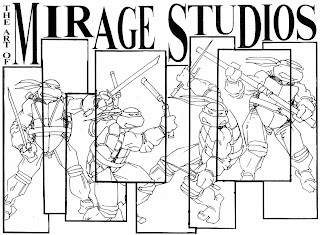 I made this mini-poster (11” by 17”) to go with my Mirage buddies when they flew to the famous comic show in Angoulême, France in 1992. 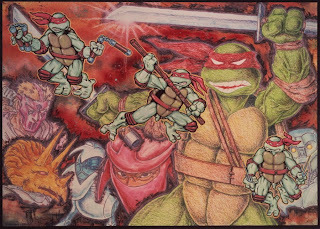 I had a lot of fun with this one -- I “cyberinked” the pencil drawing of the turtles and the machines, then colored it in Photoshop. 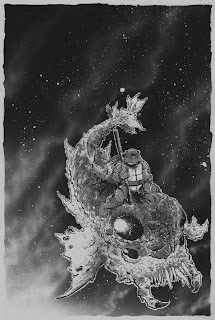 There are even two photos of me which I incorporated into the artwork.